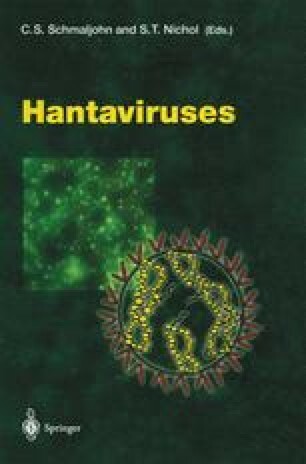 Hantaviruses are associated with two human diseases: hemorrhagic fever with renal syndrome (HFRS) and hantavirus pulmonary syndrome (HPS). These viruses are carried by persistently infected rodents, and are transmitted to humans by aerosolized rodent excreta. HFRS is characterized by fever, hemorrhagic manifestations, renal dysfunction, and shock. HPS is characterized by fever, headache, myalgia, and gastrointestinal symptoms, followed by noncardiogenic pulmonary edema, and shock. Although there are orders of magnitude fewer HPS cases than HFRS cases, the small outbreaks of HPS that have occurred have been highly lethal, with case-fatality rates of 40-60%. In addition, there is evidence that at least one of the HPS hantaviruses can be transmitted from person-to-person (Wells et al. 1997). Since 1993, 555 HPS cases have been reported in the United States, Canada, and several countries in South America. Recently, for the first time, a hantavirus was associated with an outbreak of lethal acute febrile respiratory illness in Central America (Bayard et al. 2000). A summary of hantaviruses that are known to cause human disease are shown in Table 1.